I received this photo in an email forward. It is time for Main Street One AND members of the House to wake up. 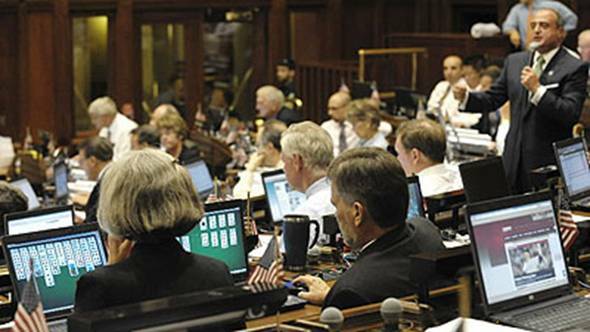 This is a shot of some members of the House of Representatives during one of the 3-day work weeks. Playing solitaire, being on Facebook and checking out sports scores. Wonder what the rest of them are doing. Note: I cannot give accurate photo credit as I do not know who took it but there was an (AP) next to the caption I received with the photo, so, who knows. Anyway, to whomever took the shot, thank you! Should we buy them a bigger screen or a ticket home, permanently?